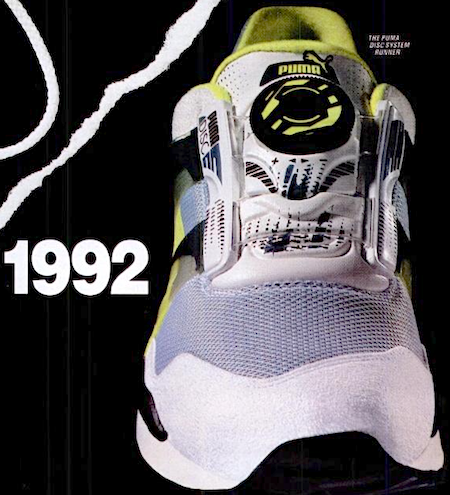 Introducing the athletic shoe of the future. 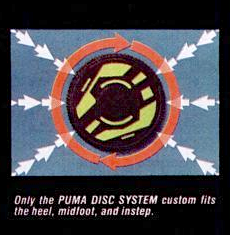 The PUMA DISC SYSTEM.  Athletic shoes with new. supports, controls, and promotes natural foot movement. cushioning and continuous shock absorption. it’s the perfect synergy between foot and shoe. the heel, midfoot. and instep. 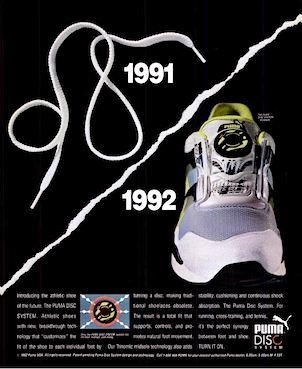 Puma Disc System Cross-Trainer "IT SEEMS GERMAN ENGINEERS WERE A LITTLE BORED JUST MAKING CARS." Converse Pro Model Leather Hi top "FEET OF MAGIC. SHOES OF MAGIC"